Grassroots resistance including public meetings, protests and occupations. 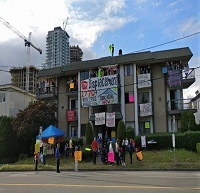 Host Stuart Richardson speaks to Zoe about the situation on the ground in Burnaby, the process of Demovictions, tenant rights and strategies to resist. With real estate prices soaring across North America we need an new paradigm shift in how we treat housing in the marketplace.